The Cisco Certified Network Associate Data Center (CCNA Data Center) certification is specifically targeted towards data center professionals looking to reduce time and cost on DC design, network gear implementation, and on-going maintenance and support. The CCNA Data Center certification provides a thorough package to address the vital areas of DC network design, installation, and on-going maintenance and support. The CCNA Data Center certification course covers concepts from describing how a network works and configuring, verifying and troubleshooting a Switch with VLANs and Interswitch Communications Using Nexus to implementing an IP Addressing Scheme and IP Services to Meet Network Requirements and Cisco Data Center Fundamentals Concepts. 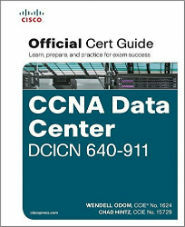 What is included with the CCNA Data Center Course?